Gifts in a Jar are a frugal and personal way to give gifts. I’ve posted a couple of gifts in a jar over the past few weeks: DIY M&M Cookies Gift in a Jar and Spiced Tea Mix Gift in a Jar. 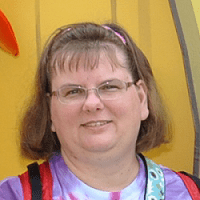 Many of us homeschool moms (and even moms who don’t homeschool) want to give gifts that show we care while not costing an arm-and-a-leg. Gifts in a Jar are such a great way to make the holidays special while not breaking the bank. 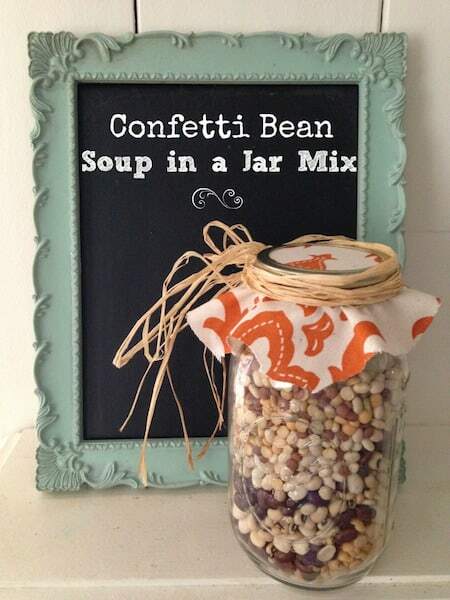 Today, I have an easy tutorial for how to make your own Confetti Bean Soup Gift in a Jar. Perfect for making for yourself or for gift giving, this Confetti Bean Soup is simple to make and super tasty to enjoy. Here is how you can get started crafting a jar of your own. In a bowl, mix the oregano, salt, pepper, paprika, dry mustard, and garlic powder. Pour the contents into the Ziploc bag. Add in the bullion cube of your choice and seal well. Set aside. NOTE: If you opt to add bay leaves, you can also add them in the bag at this time. Pour the dried beans into the jar. You can either mix them in a bowl first and pour into the jar, or you can layer them in the jar according to color. It all depends on what visual effect you want to go for. You may not use all of the beans you have to fill the jar. This is fine. Once the beans are in, pack them so the top is flat. You want about an inch to remain between the beans and the top of the jar. Fold up the Ziploc bag and place it on top of the beans. Cover the top of the jar with the circle disc and then the scrap fabric. Attach the ring to secure the jar closed. Cut a length of ribbon/raffia and tie it around the jar for embellishment. 1. Rinse beans and place in a pot with enough water, so the water level is 2 inches above the beans. Bring to a boil. Drain. Rinse beans again and allow to sit for one hour. They will not be on the heat at this time. 2. Return the beans to the pot and add six cups of water and the contents of the spice packet. Cook on high heat. 3. Stir well and bring to a boil. Allow the mixture to simmer for 2 hours. Serve when the beans are soft. If you wish, you can add in 2 cups of diced ham and/or diced tomatoes. Feel free to add any vegetables you wish, just cook until soft. This however is optional as the Confetti Bean soup is great as it is! If using the bay leaves, remove before serving. 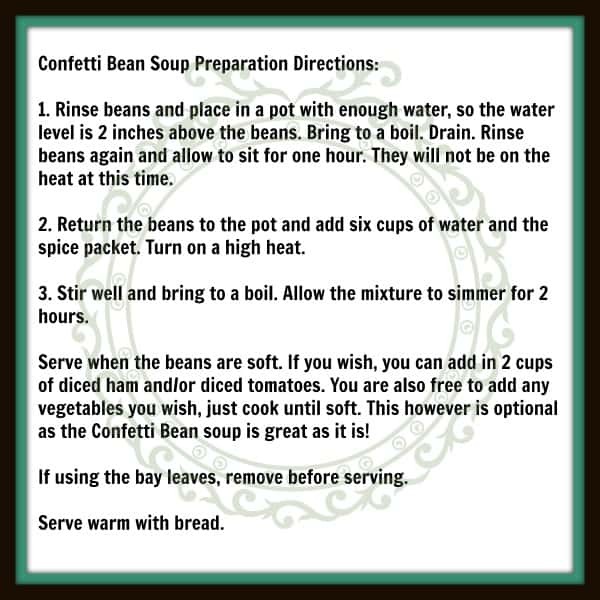 Click on the graphic above to download a sheet of these tags in pdf form to print for your own Confetti Bean Soup Gift in a Jar gifts that you make.